For so long I keep trying to get my Alexa rankings up , then it came to my sense that it updates in every 3 months and it calculates the traffic and search results for the particular site you have setup. Setting up alexa is very easy don’t know how to do read our soon coming post on How to set Up alexa. 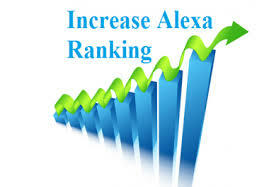 For Now I am going to tell you how you can maintain your alexa rankings and maintain it for long time. Suppose your blog is fresh and just 3 months old and your rank come near 12 lakh. Don’t get depressed on seeing this rank every new bloggers start with such a rank we started with 11 lakh ranks all over the world and now nearly 9 lakh. Maintaining the rank is very easy and if you do it in the right way. For that, just maintain 300-400 visitors per day to your site. This will get your rank up as quickly as possible. And if you are getting more than this it’s very good and your rank will soon be in 100 thousands. Big Question is how to maintain this much traffic. I have already discussed in my earlier articles on how to use Google+ and engaging visitors to your site. It’s a big question for every new blogger or even the old bloggers of how to really maintain visitors on their blog. The Solution is very simple write for the people and not for Google! Confused, Many People just need to make name In Google and does not really focus on what they are writing. I say as in my opinion write for the people as we do we write for you to understand All the major and minor problem you many or can be facing right now. Write as detail as you can in small articles long articles are not preferred by many people visiting your site. So, be short and detailed.